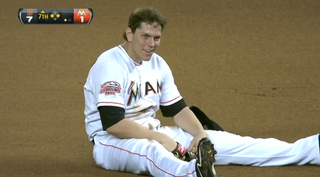 With the Marlins well on their way to being blown out (Ozzie Guillen called it "the worst game we've played all year"), at least Giancarlo Stanton and Logan Morrison found something to laugh about. Morrison, playing first, nearly got taken out when he attempted to cutoff Stanton's throw from right. After the game, Stanton immediately asked to see video of his frozen rope, while Morrison compared his moves to "Matrix Revalation."